Konami ruled much of the arcade scene in the late ’80s, early ’90s, fighting alongside greats like Capcom, Taito, and Data East. One where Konami was almost infallable was licensed titles. They are fondly remembered for their Ninja Turtle efforts, the Simpsons Arcade Game, and X-Men beat-em-ups. Forgotten though is Aliens, a vividly colored adaptation of the James Cameron film (and recent Blu-ray release). 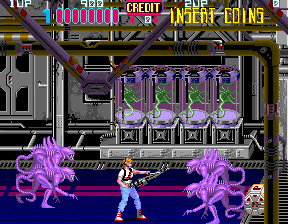 A two-player blast-a-thon, the arcade ditches any of the tension, has Ripley blasting through the facility, and wiping out hordes of Aliens, many of them exclusive to the game. What it lacks in accuracy it makes up for with intensity. The critters never stop coming, apparently oblivious to the flame thrower or three-way shot. Add in another player to fend off against the stream of face huggers, and the screen never stops. Surprisingly playable, plagued only by the extravagant difficulty in the later levels, Aliens splits the gameplay. Standard levels are typical side-scrolling affairs, playing much like a beat-em-up, minus the punching. Other levels take on a third-person view, eventually adopted for Konami’s GI Joe and Rambo III arcade cabs. Jumping onto the APC featured in the film, the player zooms down corridors, all while avoiding and blasting Aliens foolish enough to jump into the players path. It’s a chase for the orphaned young girl Newt, who will occasionally show up in the background to remind players of their goal. It’s loud, it’s aggressive, and it’s everything arcade games from that era were about. Freewheeling Flavor Key to Revitalizing Downtown Las Vegas, Official Says. Knight Ridder/Tribune Business News July 3, 2003 By Chris Jones, Las Vegas Review-Journal Knight Ridder/Tribune Business News Jul. 3–The secret to revitalizing downtown lies in the city’s freewheeling roots, one executive believes. “This is the original Las Vegas,” Fremont Street Experience President Mark Paris said of Fremont Street and its surroundings. “It’s somewhat retro-Las Vegas, is kind of a funky place and is continuing to evolve more and more that way. Paris concedes changes are needed to continue to draw visitors and locals to downtown, which is why he’s already excited about this year’s scheduled debut of a more than $16.5 million video-display system mounted on the Experience’s four-block-long canopy. Developed by the LG Group, a South Korean electronics manufacturer, the bulbs used in the new video display system will be spaced closer together than those currently in use. Coupled with the improved technology supporting its more than 12.5 million light-emitting diode bulbs, the new system’s resolution will be more than 600 percent clearer. “You have to continue to upgrade,” said Paris, who has served as Fremont Street Experience president and chief executive officer since 1996. “Technology has changed significantly in the last eight years and it needs to be changed to allow us to do more things.” The Las Vegas Convention and Visitors Authority pledged $7 million toward the upgrade in December. The balance would be paid for by the privately owned Fremont Street Experience, its member casinos and LG Group. Paris is also buoyed by recent or proposed ownership changes at several downtown hotel-casinos. In December 2001, Gary, Ind.-based Majestic Star Casino took over Fitzgeralds, while new management groups could soon separately take over the Four Queens, Golden Nugget, Lady Luck and Las Vegas Club. Thomas Breitling, who with business partner Tim Poster plans to buy the downtown Golden Nugget and its sister property in Laughlin from MGM Mirage for $215 million, said proposed changes at the Fremont Street Experience and other nearby properties played a significant role in their decision to buy into downtown. “It’s all about momentum. The enhancements to the Experience, the planned monorail station and all of the other business moves planned or under way were very important to us,” said Breitling, who hopes Fremont Street could soon rival chic tourism hotbeds such as New Orleans’ Bourbon Street and San Diego’s Gaslamp District. “We’ve talked to a lot of people about their plans for downtown and think you’re going to see an even larger investment of capital in this area. It takes time, but we think it will happen and hope to play a part in it.” Said Paris: “You’re seeing the downtown area starting to emerge into its own. There seems to be an emergence across the country of people wanting to go back downtown; people looking for the way things used to be and we’ve started to see that here.” Though his organization will spend millions modernizing what’s become the area’s signature attraction, the head of the Fremont Street Experience believes the key to revitalizing downtown Las Vegas lies more in the public’s growing desire to return to the city’s freewheeling roots. Doing it well means pulling back and evaluating what the needs of the license are.